Langmead B, Trapnell C, Pop M, Salzberg SL. Ultrafast and memory-efficient alignment of short DNA sequences to the human genome. Genome Biol 10:R25. gene expression technologies (Marioni et al., 2008; Fu et al., 2009; Wang et al. 2009). Due to the fact that RNA-Seq is relatively new, as are the multitude of bioinformatics programs that have been and are being developed, to mine this high-throughput expression information, little research has been done consisting of qualitative comparisons between and among these tools. In fact, according to the literature searched over the course of this Thesis, there have been no qualitative comparisons of expression profile accuracy for any RNA-Seq bioinformatics programs other than those contained within the papers publish upon the release of a new program. Those comparisons, however, almost entirely deal only with comparisons of each program’s technical efficiency (i.e. speed of alignment, computer memory usage, etc. . . ), and not with the biological accuracy. To my knowledge, this Thesis represents the first (hopefully of many) qualitative comparison of the biological expression profile results produced by these RNA-Seq bioinformatics programs. related reference genomes representing different phylogenetic distances. 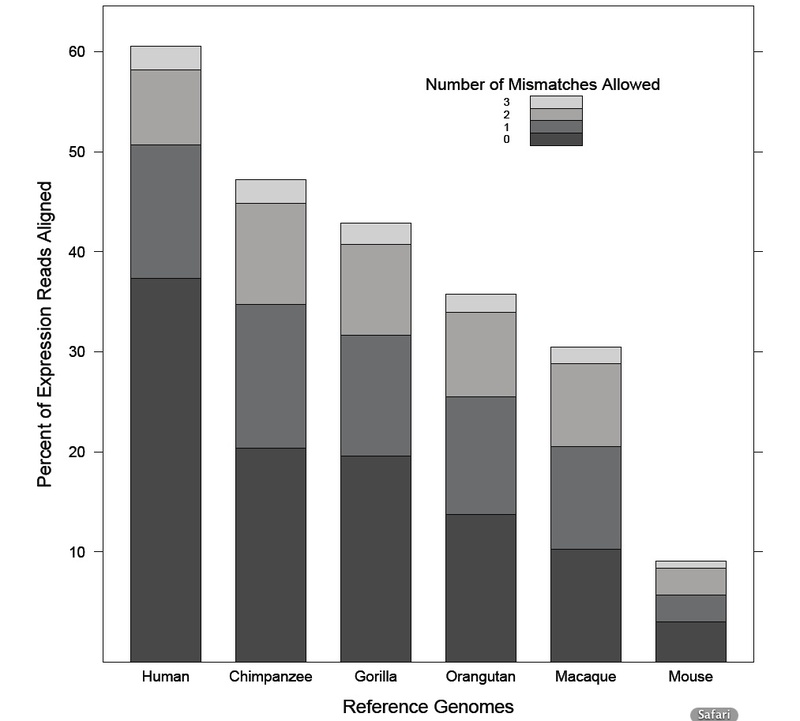 The primate lineage offers such datasets, however, the experimental design is reversed from that which would be experience for most researchers in ecologically relevant areas. Here, I used a “model” RNA-Seq dataset (human) and “non-model” (other primate) reference genomes. The expression dataset used in this thesiswas generated from Illumina sequencing of Homo sapiens kidney and liver samples (Human, NCBI SRA Accession: SRX000605”) [Marioni et al., 2008], and was obtained from NCBI’s Sequence Read Archive. In its entirety, the expression dataset contains 66,404,506 expression reads. Renn Lab computer, due to slower-than-expected alignment speeds, a within-program comparison of alignments using only BOWTIE was decided upon for the experimental analysis of this thesis rather than a between-program comparison of alignments from BOWTIE and SHRiMP. The parameter value determining allowance of a certain number of mismatches was the basis for a qualitative comparison of these expression profile results. A true-positive set of expression reads was acquired from the conspecific alignments and an analysis of which heterospecific alignments recovered this set of true-positive reads was performed using BOWTIE and custom Perl scripts. Results indicate that heterospecific alignments using the reference genomes from Chimpanzee and Gorilla are capable of returning the set of true-positive reads when the number of mismatches allowed is relaxed to at most 2 mismatches per read. These results suggest that it is possible for a heterospecific reference genome to be used when aligning RNA-Seq expression data given a certain species-to-species divergence time frame or species to-species genetic similarity. Mismatches Allowed” (2.32%). A number of data relationships can be observed in this manifestation of the BOWTIE output. The first relationship is that the percentage of the total number of reads returned decreases as the evolution divergence from Human increases and the genomic identity to Human decreases. The second is that as the mismatch allowance level is relaxed, the percentage of the total number of reads that is returned increases, however, the increase in the percentage of reads returned presents diminishing returns, meaning that the difference in percentage of reads returned at one mismatch allowance level to the next decreases as the level increases. 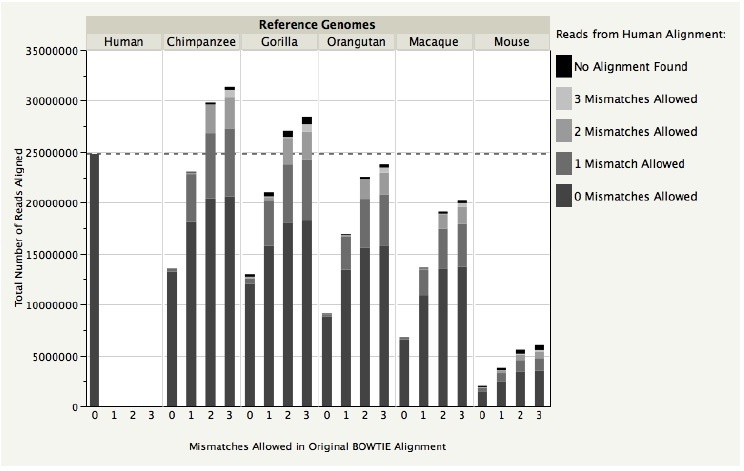 Figure 2: Stacked bar chart showing the total reads found for each heterospecific reference genome alignment and the composition of each alignment in terms of each Human-Mismatch read set. Chimpanzee (2 and 3 mismatches) and Gorilla (2 and 3 mismatches) were the only alignments that recovered a total number of reads greater than the number found in the true-positive BOWTIE alignment. and microarrays with proteomics. BMC Genomics 10: 9.
for transcriptomics. Nature Reviews Genetics 10: 57–63.